Thirty national or regional events have been organized to support WCO Members in implementing the Organization’s existing instruments and tools covering various important Customs-related areas, such as risk management, the Single Window (SW) and transit, as well as the use of the Time Release Study (TRS). With respect to the Revised Kyoto Convention (RKC), the WCO has held 15 national and regional workshops. Since the adoption in November 2014 of the Protocol of Amendment to insert the Trade Facilitation Agreement (TFA) into the main World Trade Organization (WTO) Agreement, seventeen WTO Members have ratified the TFA to date: Hong Kong (China), Singapore, the United States, Mauritius, Malaysia, Japan, Australia, Botswana, Trinidad and Tobago, the Republic of Korea, Nicaragua, Niger, Belize, Switzerland, Chinese Taipei, China and Liechtenstein, respectively. The TFA will take effect once the Protocol has been accepted by two-thirds of the Members of the WTO, i.e. 108 Members in total, as per the WTO’s current membership figures. Adding new tools and best practices, which have emerged from WCO Members relating to the implementation of the relevant trade facilitation measures, to the Guidance for the TFA developed by the WCO. The Guidance aims to support an understanding of the linkages between the TFA and WCO instruments and tools, such as the RKC. Delivering more than 90 national and regional missions for technical assistance/capacity building under the Mercator Programme. In this regard, the WCO is continuing to develop its pool of experts and organizing its first TFA accreditation workshops. Providing guidance and assistance in setting up National Committees on Trade Facilitation (NCTF), more particularly on stakeholder mapping, how to chair meetings, prepare agendas, and ensure the necessary follow-up. The WCO also sent out a questionnaire in order to collect its Members’ national situations and experiences related to the establishment of NCTFs. The results were published under the TFA section on the WCO website which also contains Members’ case studies on NCTFs. Holding the second and third meetings of the WCO Working Group on the TFA (TFAWG) which were attended by representatives of Customs administrations and other concerned authorities (Finance, Trade and Foreign Affairs Ministries, etc. ), as well as representatives from the WTO, other international organizations, donor institutions, the private sector and academia. Organizing three regional workshops in Asia/Pacific (Jakarta, Indonesia), Europe (Budapest, Hungary) and the North of Africa, Near and Middle East (Manama, Bahrain) in the first half of this year. The workshops were attended by Customs officials and representatives of interested Ministries, and the discussions focused on trade facilitation issues, the TFA measures, and relevant WCO instruments and tools. Participating in high-level meetings with key parties and individuals to emphasize the key role of Customs and the WCO in the implementation of the TFA. All Customs tasks and responsibilities are performed, at least in part, on the basis of data received from businesses engaged in trade – for example, data for purposes of revenue collection, risk management, admissibility checks, resource allocation and cooperation with other agencies, as well as the collection of statistical data for macroeconomic decisions. the creation of a Virtual Working Group on Data Quality whose work will include input from interested WCO Members and individual members of the WCO Private Sector Consultative Group, and which will report to the WCO Permanent Technical Committee (PTC) where strategic issues and possible solutions would be tabled for discussion. The WCO-ICAO [International Civil Aviation Organization] Joint Working Group on Advance Cargo Information (JWGACI) was set up in 2014 to discuss and recommend modalities for sharing and using advance cargo information (ACI) in carrying out security risk analysis by Customs and civil aviation authorities in order to mutually support each other and strengthen air cargo security. The Group comprises eight Members and one additional Member to co-chair, from each side, as well as six relevant stakeholder representatives. The JWGACI is following a two-phased approach. On completion of Phase I, a report on the concept of ‘Pre-loading Advance Cargo Information’ (PLACI), its benefits and the cost of implementation, as well as the challenges and potential way forward was produced, and later endorsed by the WCO Technical Expert Group on Air Cargo Security (TEGACS) at its February 2015 meeting, and by the ICAO Aviation Security Panel (AVSECP) in April 2015. The JWGACI has now moved to Phase II of its work, i.e. dealing with issues concerning practical and technical implementation. To this end, the Third Meeting of the JWGACI was held from 18 to 20 May 2015 in Washington D.C., where it was decided to continue further work, including developing details of the ‘Concept of Operations’ – a document describing what a system does, and which will be used to get stakeholders in the system to agree on a common understanding, thereby providing clarity of purpose to a project. Work on the harmonization of Authorized Economic Operator (AEO) and Regulated Agent/Known Consignor (RA/KC) programmes is progressing well, and the ICAO and WCO Secretariats, together with other stakeholders, are currently working on conducting a joint AEO/RA pilot in Vietnam, as agreed by their Customs and aviation security authorities, and have already developed draft Terms of Reference for the joint pilot. An AEO/RA guidance document and a joint AEO/RA security programme template have also been developed. These documents include all appropriate ICAO and WCO references, as well as a structure that allows a comprehensive comparison of the two security regimes. The two Organizations have developed a joint training module to assist both Customs and aviation security officials to better understand the international air cargo supply chain, each other’s roles, and the roles of other important actors. Based on this module, the first joint pilot workshop for the WCO Asia/Pacific region has been held, and the possibility of organizing further similar joint workshops is being explored. The Recommendation of the Customs Co-operation Council concerning the Use of Advance Passenger Information (API) and Passenger Name Record (PNR) for Efficient and Effective Customs Control has been amended. a European Union (EU) Customs Data Model Derived Information Package. Around 43 countries have active projects underway which involve the implementation of the DM. In this regard, a WCO Member-wide tabulation status report of adoption, and indicating the increasing use of the DM, is available on the WCO website. participated in a seminar on the development of a regional SW in the Eurasian Economic Union (EEU). The review of the SAFE Framework of Standards (SAFE) has been completed. The 2015 edition of the SAFE now includes a Pillar 3 on Customs-to-Other Government Agencies which foresees cooperation at three levels: cooperation within the government; cooperation between and among governments; and multinational cooperation. 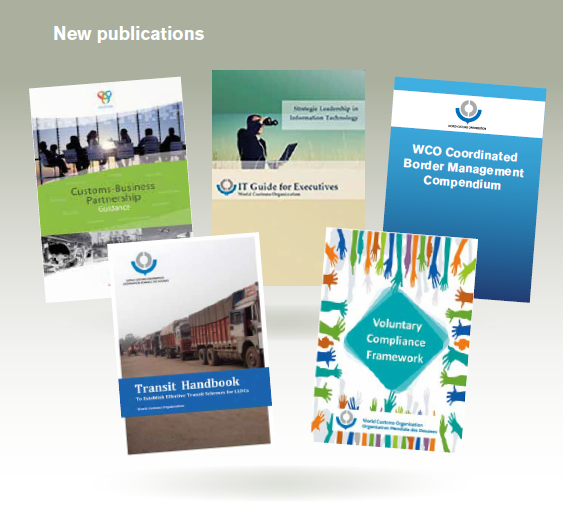 The WCO has already developed a number of tools that support this Pillar, notably the Compendiums on Coordinated Border Management and the Single Window, which are ‘living’ documents that are continuously being updated. Furthermore, the instruments and tools related to risk management mentioned in the technical specifications of Standards 4 and 7 of Pillar 1 and other relevant places in the SAFE text have been updated in view of the development of Volumes 1 and 2 of the WCO Risk Management Compendium. Additionally, new tools have been added to the SAFE Package, such as the Toolkit for the implementation of Pillar 1 (Customs-to-Customs), Customs-Business Partnership Guidance, and the WCO Recommendation concerning Customs Formalities in Connection with the Temporary Admission of Container Security Devices (CSDs), adopted in June 2013. Existing publications have also been updated, namely the Guidelines for the Procurement and Deployment of Scanning/NII Equipment (including the Guidance Material on Threats and Technology Solutions), and the WCO Compendium of Authorized Economic Operator Programmes (AEO Compendium). The workshop was attended by over 100 participants representing Customs and designated postal operators from 33 countries. It sought to broaden the understanding of postal-Customs clearance work through face-to-face dialogue, including the promotion of electronic exchange of information, the sharing of information on security-related developments, and the sharing of countries’ working experiences and best practices. Additionally, the WCO is closely working with the UPU on a number of issues of mutual concern, which, in particular, include advance electronic exchange of data; postal supply chain security, and e-commerce. A Virtual Working Group on the Future of Customs (VWG FC), consisting of representatives from Customs, international organizations, the private sector and academia, has been established, following discussions which took place on this topic at the 207th/208th Sessions of the PTC in March 2015. As a starting point for discussions, the VWG FC will use the ‘Customs in the 21st Century’ strategic document. Members of the WCO are encouraged to initiate in-depth research on future-orientated topics. Some of the topics which are already being discussed within the VWG FC include border models, information management, exchange of information, cooperation between Customs and tax authorities, 3D printing, natural disaster relief, e-commerce, and others. The discussions on the future of Customs will continue at the upcoming sessions of the PTC and the WCO Policy Commission. The impact of the increase in e-commerce and issues emanating therefrom has been widely discussed during the past year. The Focus section of the WCO News magazine offers some insights, including the way forward, into this topic, both from a trade facilitation and revenue collection point of view.